50,000 Mile Sign-Up Bonus on the Barclaycard Arrival Plus – $525 in Free Travel! 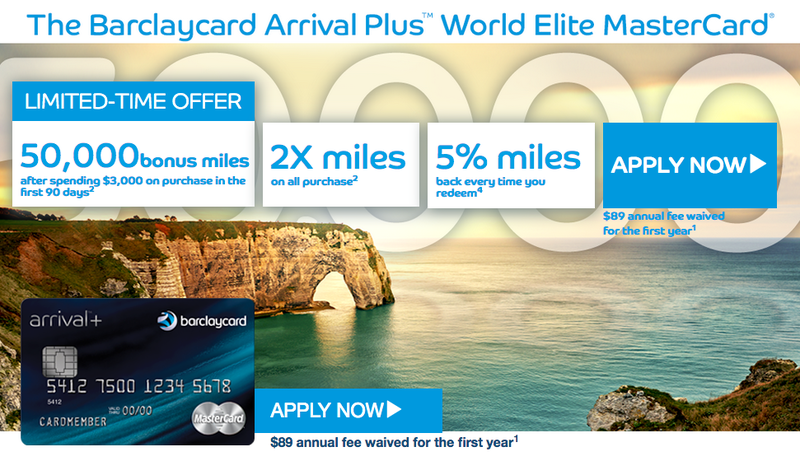 Barclaycard is offering an increased sign-up bonus on the Arrival Plus World Elite Mastercard. Now you can get 50,000 bonus miles after spending $3,000 within the first 90 days. That makes the sign-up bonus worth $525 in free travel, which is $105 higher than it was in the past! This card has long been one of my all-time favorite travel rewards credit cards since it offers 2x miles on every purchase and has a simple, straightforward redemption system. All it takes to redeem miles is to make any travel purchase using your Arrival Plus card and and then redeem miles online at a value of 1.0 cent each. The card is also great for covering any travel costs in situations that you cannot use airline miles or hotel points. In fact, just last week I redeemed 60,000 Arrival miles to cover $600 of my upcoming Airbnb stay. You can’t beat that! Earn 50,000 miles after you spend $3,000 within the first 90 days. That makes the sign-up bonus now worth $525 when the miles are redeemed on travel purchases. The increased sign-up bonus is marketed as a limited time offer, but as was the previous 40,000 mile offer and there is no published end date. Bonus: 50,000 miles after spending $3,000 in the first 90 days. The Arrival Plus is one of the simplest and most rewarding credit cards out there. I’d say for anyone looking for a straightforward and high earning rewards credit card, this is for sure one to consider. With the Barlcaycard Arrival Plus you will earn 2.1% return on every purchase. Unlike other cards that typically earn more on bonus categories and 1x on all others, the Arrival Plus card earns you 2x miles on all purchases. In a way this is nice and keeps things simple for anyone who doesn’t always want to pull out a different card for different types of spending. Instead you’ll earn 2x miles on everything, all year long. This way you’ll earn some of the highest rewards available from any card and you don’t have to think about when to use which card for special purchases. I won’t lie, even though I’m all about maximizing my miles and points, I actually use my Arrival card more than any other card I own. In my opinion the across-the-board 2x earning and ultimate flexibility makes this card one of the best cards for the all-around traveler. When you redeem Arrival miles towards travel purchases you’ll some of your miles back! You get a 5% mile rebate whenever you redeem miles. For instance, if you redeem 50,000 Arrival miles towards a flight to get a statement credit, you will earn 2,500 miles that will be instantly credited to back your account. This feature makes the earning on the Arrival Plus card actually 2.1% back on all purchases puts it among the top earning fixed-points card on the market. No foreign transaction fees. Use the Arrival Plus card on international trips and you won’t pay any fees when making purchases in foreign currencies. The annual fee is waived for the first year. The 50,000 mile sign-up bonus is even more attractive because the $89 annual fee is waived the first year. After that, you’ll have to make the decision whether or not the card is worth keeping or not. Free FICO score. Barclaycard offers a free FICO score through your online banking portal, which among other ways of checking your credit score for free can be useful for monitoring your credit score activity. It’s great to see this increased 50,000 mile offer on the Barclaycard Arrival Plus card since it has remained at 40,000 miles ever since it was launched in 2014. With Chase aggressively marketing the new Sapphire Reserve card in an attempt to gain customers it appears that Barclaycard and other credit card issuers are taking note. At the end of the day, let’s just say a little competition in the rewards credit card market is a good thing. Can I earn the sign-up bonus more than once? How can I check my Barclaycard credit card application status? How quickly will the bonus miles post to my account after meeting the minimum spend? How much is the 50,000 sign-up bonus worth? The 50,000 mile sign-up bonus is marketed as $500 in free travel, but when you redeem the miles for travel you will earn 5% of your miles back. This makes the bonus actually worth $525 in travel. How much are Arrival miles worth? When you redeem an Arrival miles for travel statement credits you get 1.0 in value per mile. If you redeem arrival miles for normal statement credits, gift cards, or merchandise you will get 0.5 cents in value per mile. What qualifies as travel when redeeming Arrival miles? What is minimum redemption level of Arrival miles? The minimum level for redeeming Arrival miles for travel is 10,000 miles for a $100 statement credit. You can redeem towards the whole amount of a travel purchase or just a portion. How long do I have to redeem miles towards travel purchases? You can redeem Arrival miles up to 120 days from the date of the travel purchase. Can I get approved for the Arrival Plus if I currently have another Arrival card (fee/no fee version) open? No, Barclaycard will not approve you for a second Arrival card. This goes for having either combination of the fee or no fee version of the Arrival card since they are considered the same product. Will Barclaycard match a higher bonus offer? There are few data points and it’s still unclear if Barclaycard matches a higher sign-up bonus offer if you recently applied for the same credit card. If you recently applied for the Arrival Plus 40,000 offer try sending a secure message requesting an offer match. If that doesn’t work try calling in and requesting to speak with someone higher up to request an offer match. Is the annual fee waived the first year? Yes, the $89 annual fee is waived the first year. If you want to keep the account open after the first year and don’t want to pay the fee you can downgrade the card to the no annual fee Arrival card. What credit bureau does Barclaycard pull? It really depends on what city and state you live in. In different regions a credit card issuer may be more likely to pull one credit bureau over the other. The best way is input your info here and see what other customers have reported.